This entry was posted on August 8, 2018 by Herb. RAPID CITY, S.D. (August 7, 2018) – It certainly didn't take long. Reigning Grand National Champion Jared Mees (No. 1 Indian Motorcycle Rogers Racing SDI Scout FTR750) only had to stew on a rare defeat for two days before reasserting his position atop the American Flat Track pecking order with Tuesday night's triumph at the Harley-Davidson Black Hills Half-Mile presented by Law Tigers Motorcycle Lawyers in Rapid City, S.D. The AFT Twins presented by Vance & Hines victory didn't come easily, however, ranking as perhaps Mees' most hard-fought and hard-earned of the season. It was ultimately taken by a scant 0.032 seconds following an epic heavyweight battle with Jeffrey Carver Jr. (No. 23 Roof-Systems of Dallas/Indian of Metro Milwaukee Scout FTR750), one of just two riders to have beaten Mees straight up in 2018. The pair threw everything they had at one another over the course of 25 laps, utilizing multiple lines, creative overtakes and an abundance of aggression. Mees established control of the lead over the final handful of laps and managed to just hold Carver at bay despite one final strike that fell a half-a-bike-length short at the checkered flag. The win was Mees' 10th in 14 races this season. With six races remaining on the season slate, he's already equaled the tally that carried him to a lopsided championship win in 2017. It also stood as the 26th Half-Mile victory of his career, moving him into a tie with Will Davis for second most in AFT history. After winning his dogfight with Carver, Mees said, "Oh man, it was a fantastic race… I didn't feel the strongest earlier on, but during the Heat and Semi we showed some good speed. I knew the Main was going to be tough. Carver is always fast, but he seemed to struggle a little in the Semi, so I was expecting to battle with some other guys in the Main. But Carver got a good start and he was riding so good. It was everything I could do pull the win off today. It felt good. To win 'em this close is awesome." Former champion Bryan Smith (No. 4 Indian Motorcycle Racing backed by Allstate Scout FTR750) rounded out the podium in third, marking a superb return to action after sitting out Sunday’s Buffalo Chip TT while still on the mend from injury. Mees is rapidly closing in on a second consecutive Grand National Championship. Thanks to racking up a quick 45 points in this year's 78th Annual Sturgis Motorcycle Rally doubleheader, he now leads Henry Wiles (No. 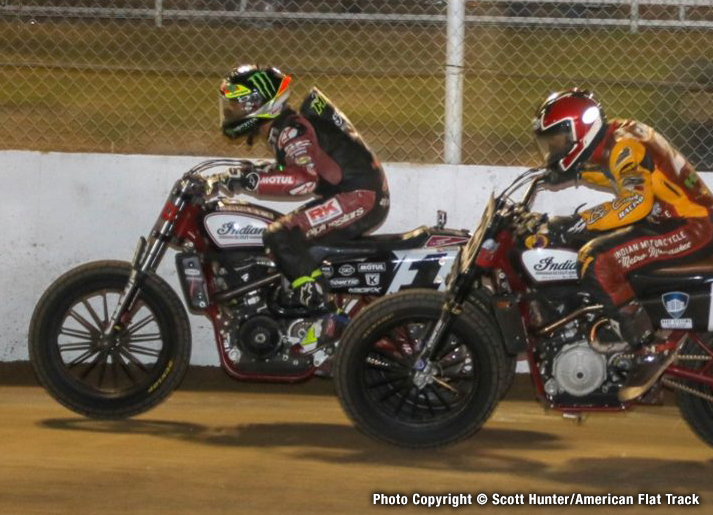 17 Bandit Industries/Wilco Racing/Willy Built Indian Scout FTR750) by 102 points with just 125 points left in play. 2 ... Jeffrey Carver Jr.
5 ... Kenny Coolbeth, Jr.